"Early Childhood Education: An International Encyclopedia" by Rebecca S. New, Moncrieff Cochran et al. 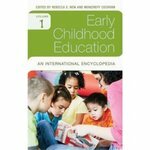 Early Childhood Education: An International Encyclopedia, Ed. Rebecca S. New and Moncrieff Cochran. Greenwood Publishing Group, 2006. Susan D. Franzosa is a contributing author, "Elizabeth Palmer Peabody," "Kate Douglas Wiggin," and "Patty Smith Hill". Book description: This four-volume compendium addresses key historical and contemporary issues, research, theoretical perspectives, national policies and practices in early childhood education and care. Early childhood education has reached a level of unprecedented national and international focus. Parents, policy makers, and politicians have opinions as well as new questions about what, how, when, and where young children should learn. Teachers and program administrators now find curriculum discussions linked to dramatic new understandings about children's early learning and brain development. Early childhood education is also a major topic of concern internationally, as social policy analysts point to its role in a nation's future economic outlook. -- Publisher description. Franzosa, Susan Douglas. "Elizabeth Palmer Peabody," "Kate Douglas Wiggin," and "Patty Smith Hill," in Early Childhood Education: An International Encyclopedia, Ed. Rebecca S. New and Moncrieff Cochran. Greenwood Publishing Group, 2006. New, Rebecca S.; Cochran, Moncrieff; and Franzosa, Susan D., "Early Childhood Education: An International Encyclopedia" (2006). GSEAP Faculty Book and Media Gallery. 5.